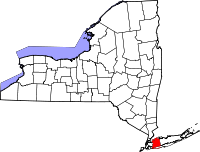 Nassau County is a suburban county in the New York Metropolitan area east of New York City and west of Suffolk County, in the U.S. state of New York. In 2000, 1,334,544 people lived there. It and Suffolk County are together referred to as Long Island. Until 1899 Nassau County was part of Queens County. Along with Suffolk, it was named the safest county in the United States in 2005 by Forbes magazine. This page was last changed on 28 June 2018, at 03:36.